Do You Really Think the Macworld Keynote's Leaked on Wikipedia? Seriously? We weren't going to post anything on this, but lots of sites seem to be picking it up. 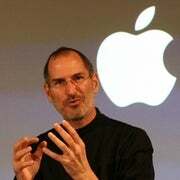 Do you really think that Steve Jobs would let his keynote be leaked, and on Wikipedia of all places? The keynote that many of his own people don't even know about? We've even heard about employees who worked on the products being announced at Macworlds being surprised that Steve Jobs pulls it out during showtime. But if you really want to read the list of "what's going to be announced," hit the jump.